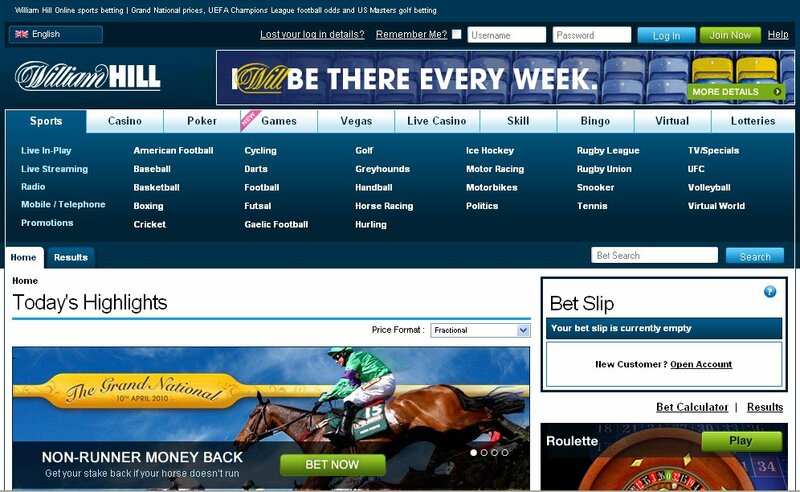 William Hill - one of the most popular British bookmakers. William Hill is a well-established reputable London and Leads based bookmaker established in 1934 by a businessman William Hill. This British bookmaking agency started as a small telephone / postal sports betting service based in London's Jermyn Street. Back then, it accepted bets with enclosed cheques that were usually sent weeks in advance of events. In 2010, William Hill moved their online betting division (sportsbook and games) to Gibraltar. Today, William Hill's land base consists of almost 2,390 betting shops (and still growing) across the UK and Ireland which is ca. 25% of the UK and Irish market. The company employs over 17,000 people in the UK, Ireland, Israel, Italy and Bulgaria and processes over 1 million betting slips a day. Since 2002, William Hill is also listed on the London Stock Exchange. Moreover, the British bookmaker owns and operates two Greyhound stadia: in Sunderland and Newcastle. As it is the case with many bookmakers, William Hill is a registered IBAS bookmaker. WilliamHill went online in 1998. William Hill Onilne is a joint venture between WH (71%) and Playtech (29%), worldwide gaming software development company. At present WHO serves punters from more than 175 countries offering 7 languages on their website. In 2007 alone, WHO took online bets from 169 countries for more than 60,000 events. William Hill’s telephone betting service is one of the largest in the world with about 132,000 active customers at the threshold of 2010. The service can handle more than 500 calls at the same time, and claims to have accepted 125,000 bets on the 2007 Grand National horse race. William Hill bookmaker was a pioneer in many ways as well. It was the first bookmaker to introduce freephone, credit betting and debit card deposit. William Hill is one of the most titled bookmaker companies, prize winner of all possible premiums and awards. In 2013 according to The International Gaming Awards the bookmaker received an award in the category of the Best Mobile Operator of the Year. During the eGR Awards ceremony in 2012 the company received the status of the Best Sporting Operator of the Year and a title of the Best Slot Operator of the Year. In 2011 William Hill was honored the title of the Best Operator of the Year according to eGaming Review magazine, getting ahead of such competitors as Bet365, Betfair, 888 and other. Twice, in 2012 and 2013, was bookmaker William Hillnamed Bookmaker of the Year at the annual Betview Awards. In 2013 the bookmaker company William Hill purchased assets of another British firm Sportingbet. William Hill provides it's customers an array of sports betting and gaming opportunities given throughout many different channels like: mobile (Iphone, Ipad), telephone betting, text (sms) betting, online web site, betting shops which enable them to play and bet. 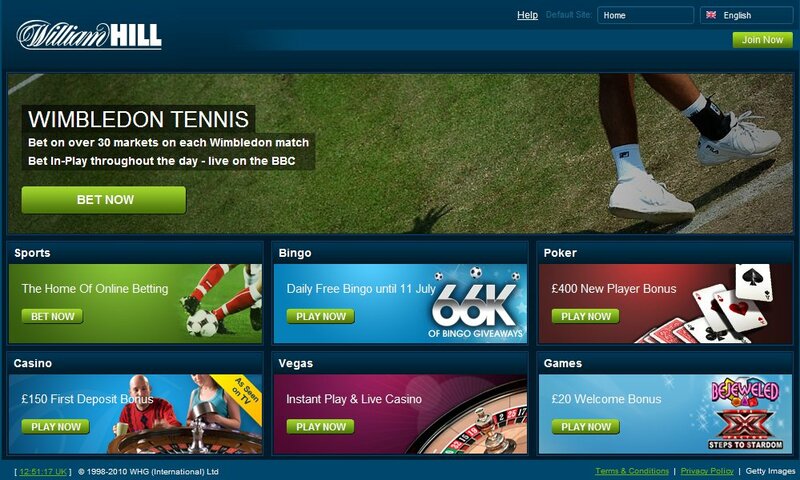 WilliamHill.com offers a wide range of sports with a particular focus on the British tournaments, leagues and cups. There is a particularly good offering on hurling, darts, soccer, horse racing, greyhounds, cricket, Gaelic football, rugby, snooker, tennis and more. Non-sports betting in available in the form of Politics, TV specials and Virtual World. Especially recommendable is the horse racing service. Apart from a great coverage of UK and Irish races and various horse betting options, the section includes comprehensive lists of UK horses/jockeys/trainers, racing post form guides, impressive live horse racing video streaming and radio services, as well as non-standard horse betting available in Special Markets. In addition to that, William Hill's Best Odds Guaranteed offer ensures that punters betting on UK and Irish horse and greyhound races can always take the Starting Prize if it represents a better value than the price they took. William Hill's neatly organized football betting section is also first class and surely should satisfy even the most demanding punters. There are up to 200 football markets for top European matches, quality live match previews as well great promotions such as blockbuster coupons which guarantee higher payout percentages. Football betting with William Hill Online is very convenient thanks to the data provided by Opta Sportsdata, Europe's leading provider of sports performance statistics. William Hill's gaming offer includes Vegas (Instant and Live Casino), Poker, Casino Club, Bingo, Skill (e.g. Blackjack, Domino duel, Backgammon, Poker dice), Virtual (with popular Horse, Greyhound and Motor races every 3 min), Lotteries (49's, The Irish lottery, N.Y. Lottery, Spanish lottery). William Hill extended sponsoring for Scottish FA Cup until 2016. In 2009, William Hill signed a three-year sponsorship agreement with Spanish top division Malaga Football Club. In September 2010, however, the deal was cancelled by ‘mutual consent’ after only one season. Sporting literature is also promoted by the bookmaker through the annual William Hill Sports Book of the Year award. In 2009, WH signed a four-year contract to support the Winter Festival at Kempton Park racecourse including the King George VI Chase. Since 2010, the bookmaker is the titular sponsor the most important English Greyhound Derby. The event was continually sponsored by the company with the exception of the years 2007-2009. William Hill's poker room sponsors the William Hill Poker Grand Prix. In recent years it has activated its sponsoring policy signing a two-year agreement with the Scottish National Team, it can also boast of being the official sponsor and partner of the football FA Cup. Moreover it regularly sponsors the World Snooker Association. Are we in for a sensation in the match between France - Nigeria?